I like Alice in Dissonance for the most part. Despite my well-earned reputation, I do love to see good art, ambitious use of technology and the group has consistently delivered on that end. Their artistic work alone can easily stand with other Japanese games, not just VNs, and the fact that they’re determined to improve on this deserves praise. And if only visual novels were just about art, then it wouldn’t seem like I hate them. One of the jokes I often make with my fellow critics is that certain developers need to hire someone to stand in the room with them while they’re writing a game with a kendo stick or yardstick (especially those who like fanservice a bit too much). Their only job would be to ask every now and then about the plot being writing and if it doesn’t make sense to whack said writer over the head until they understand what they’re writing is stupid. We got a taste of what NOT having such a person on staff can lead to in Fault One where our supposed heroines took a backseat to a long, yet entertaining, family tragedy. The demo for Silence the Pendant again show their rampant ADD with a strong focus on optional game systems and Live2D, but not the plot of the game which promises to explore the backstory of a character we barely know now. Now, originally, this was supposed to be one game. But apparently, there was so much content planned for Fault Two, AiD was forced them to split the game into two entries. For those keeping track, this would be the point where that army of kendo-wielding plot fasci I mentioned earlier would come in and start whacking. We’ll get to why in a moment, but perhaps it’s best if we started at the top? This is Fault Milestone Two Side: Above. We pick up Fault Two exactly where Fault One left off with our trio of heroines facing down Melano: the leader of the faction that forced them out of Rughzenhaide. This confrontation forces an already mana-depleted Selphine out of her own consciousness as a condition called ‘Empress Syndrome’ strikes then and there: replacing her with a far more cutthroat ancestor. From there Ritona is forced to fight Melano and everyone involves realizes just how badly outmatched they are when Melano ends the world. I am not even joking. These turn towards shonen is good and shows me how capable AiD is when it comes to telling a strong action-adventure story. The fight itself is fantastic, but it’s moment when everything is destroyed, the game glitches out completely and starts over to focuses on Melano standing in the ashes of the world is a powerful image that immediately establishes the stakes of the entire series. This is a person that can easily capture anything they want, so the previous battle of Rughenzenhaide was ultimately pointless. What Melano wants is a mystery, partially to increase her threat as a villain and partially because we know zip about the protagonist: which might clue us in on what the Hell’s going on. But ultimately, when she snaps her fingers and returns to the point right before she unleashes her attack, it’s enough to grab the audience’s attention and bring us back into focus. Actually, that entire first hour is more than enough to hold our attention. Right after these events happen and Melano leaves them to ponder exactly what they’re up against (a classic villain move that is warranted here) both finally hit their mana limit. Because of her training, Ritona is still alive but is unable to do anything if someone tried to attack them. Selphine, on the other hand, is right at death’s door. This leaves Rune to get them to safety and its harrowing to read. Even though there is little emotional connection to these characters, what has been established is enough to not want to see them die like this. Just like with the first entry, the seeds of a strong title are here and you want to see what happens next. This is where we start running into problems. The first is on the trip to a mana-rich port. Beyond the nitpicking on just how this world is composed, which I’m going to need a lot more time to rip apart, it felt like we’re finally delving a little deeper into Ritona and Selphine. The first episode can be forgiven on that front because they were exiled then pulled into events outside of their control. However, after that and because of this scare of losing our titular characters, the timing felt good to slow down and let them breathe a little: bringing some needed development into frame. We do get some history about Ritona and Selphine’s homeland, along with an explanation on Empress Syndrome. Other than that, the rest of that crucial time is spent exploring how amazing Rune Levitz is. At this point, and knowing what’s going to happen and the game’s midpoint, I’d argue that Rune is the legitimate protagonist of this series. On paper that isn’t a terrible call since she has an interesting backstory and enough time invested in her for the audience to give a damn: despite her being an automaton. The problem is Rune doesn’t have any narrative agency. That comes with Ritona and Selphine and their lack of development means the entire story is weaker. As much as I enjoyed the first hour of the VN, the biggest point is the action scene and the first few moments of their nautical journey away from Kadia. From there, the writing’s focus fractures thanks to the introduction to some new side characters in Rughenzenhaide. This breaks whatever tension we could have had for good and also serves as a warning sign of things to come when it comes to the supporting cast of the Fault Milestone series. This issue has been bugging me with this series for some time now and Side: Above has that issue nearly reaching critical mass. That is that only one and a half games into this franchise and the world is already beginning to feel bloated with supporting characters. Over the course of Side: Above, we are introduced to fourteen new supporting characters: Sol and his sister (2), the Pharmacist and his cronies (4), the staff and patients of the underwater hospital who will carry over to Side: Below (3), and the three Rughenzenhaide characters on the hunt for Ritona and Selphine PLUS their instructors (5). These fourteen join Melano and her subordinates (4), Rudo and the staff at Zhevitz Enterprises (4), and Selphine’s alter-ego Rheagan (1) bringing the supporting cast count by the halfway point of the second chapter of the series to TWENTY-THREE supporting characters. Some of these won’t carry over, but if you’re keeping count, at least seventeen of the twenty-three characters will be regular support characters of the series moving forward not counting any new characters that will be introduced in Side: Below or Silence the Pendent. Now, a larger supporting cast isn’t a bad thing on its own. However, they have to have some sense of utility to the overall plot: either giving the main characters a path to deepen themselves or to set up the major thematic points of the overall narrative. The best example I can give you is Fullmetal Alchemist: Brotherhood – a franchise with a massive supporting cast where everyone plays a specific role and the main characters (Ed and Al) grow through their interactions. To their credit, Fault’s supporting cast does advance particular plot points, but those points are contained and have no influence on the larger story. 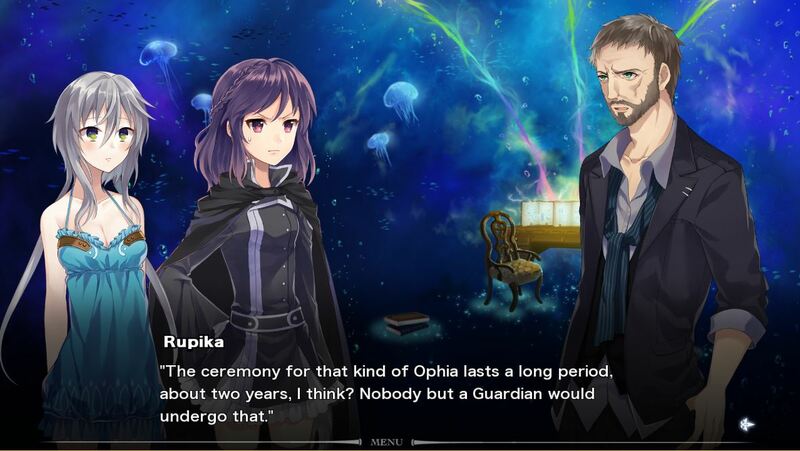 In Side: Above in particular, the only supporting character that was introduced here that has an impact on the larger story is Doctor Rupika: the man who kidnapped Ritona at the midway point of the game. His role in the underwater facility, connection to Rughenzenhaide and plans for Ritona all make him a threat that could connect the entire series so far: even more than Melano and her posse. It was a smart move to keep him as a loose end and hopefully he can fulfill a much-needed narrative function in the next one. Other than the Doctor, everyone else here feels like a distraction and that includes the storyline about Sol and his sister that make up the rest of the story. I understand what AiD was aiming to accomplish here. Sol and his sister are a different take to the Rudo and Rune Zhevitz plot idea while giving our main characters a problem they can’t immediately solve: subverting the idea of a group of heroes riding into town and solving everyone’s problems. However, they don’t actually subvert anything here because Ritona is kidnapped at this point and Selphine has checked out: giving herself over to Empress Syndrome and letting Rheagan take the lead. And remember, Rune has zero narrative agency so her role here is less as an influence and more as an observer. Unfortunately, that leaves the plot to absolutely crater. The story itself of Sol dealing with his sister’s illness by becoming a thief and working with the monopolistic Pharma Guild is not terrible (a little preachy perhaps), but with NONE of our main characters directly invested, it has no impact to the plot. For the most part, nothing happens as there is no real solution to the kids’ problems and we’re just waiting for everyone involved to figure that out. And since it wraps up in a neat little bow, it has no function other than the give Rune something to watch while they wait for Side: Below to begin. This isn’t a small aside I’m talking about here. We are talking about five hours of game time at minimum watching these characters do next to nothing that could have been cut completely and the game would’ve been fine. In fact, it may have been better since it would’ve kept the tension that came when we found out Ritona was abducted. Instead, we end this one with only Sol having any kind of closure since we get a peak of his life in the near future. Rune and Selphine having nothing to do right now, Ritona has basically been written out of the story, and, at this point, what IS the major storyline of the Fault Milestone series? Nobody is in a rush to get back to Rughenzenhaide, so what exactly are our main characters trying to achieve here? These are not questions to leave an audience. At this point we should have some concrete sense of direction and who these characters will become by the end of their journey. After all of this time, the single biggest critique I can give AiD is that their key franchise feels stagnant. The Presentation for Side: Above is the strongest card they have to play and, credit where it’s due, the game looks and sounds good. One of the small artistic touches I love about the series is that they do their best to make each locale the main cast visit feel unique through its architecture and clothing. Kadia from FM1 is an industrialized nation and it felt closer to, say, 20th century London or New York just by the background art and the local attire. Viscanta, the location for most of Side: Above, is coastal and is closer to Spain and Greece in terms of visuals. It’s a small visual cue, but in a medium that has a knack for making every location look the exact same, I’ll take the visual diversity where I can get it. At the time of its release, AiD were among the first to experiment with a 3D camera system: bringing the ‘cinematic’ element to their games they now tout regularly. I have critiqued this technology off and on over the past few years, but I’d like to take a quick moment to dig underneath the surface level on the subject. After all, Side: Above is probably the best and worst showcase for this system to date. When used correctly, AiD’s proprietary 3D camera is a good, and damn near excellent system. What is that correct use? In action scenes. Side: Above has several action beats, but its biggest fight scenes (featuring Ritona vs. Melano and Rune vs. the Pharma Guild respectively) are fantastic for the medium thanks to using well drawn Event CGs and proper knowledge of certain camera tricks: including heavy quick cuts and zooms. The header image, a zoom in on Rune as she activates her robotic abilities, is one of my favorite moments in the game just because of its timing. In proper animation or even proper film-making, this is a year one course. But the knowledge and application of it shows that AiD understands, for the most part, when and how to make the most of the technology. This isn’t consistent though as they also experiment with the camera constantly: testing every camera function they can in a way that can be distracting. We’re going a bit deeper into the technical weeds, but there is a particular reasons this camera often doesn’t work and that’s the aspect ratio. Most higher-quality visual novels are made these days for 720p. For anyone who records themselves or uses photography, that may not see like a big deal. However, drawing something for a 720p aspect ratio is…interesting. I am not an artist and I’m sure that isn’t as bad as, say, 1080p or 2160p (4K). However, the idea is that to maintain the aspect ratio of those formats, whatever is in camera has to be larger enough not to mess it up. So, the bigger the aspect ratio, the bigger the artwork has to be. This camera needs, at the very least, 1080p so it doesn’t break its aspect ratio and Side: Above hits 720p at best. So, whenever it zooms in for too long, all we have to show for it is a fuzzy picture. There seems to be some work to fix this in the tech demo for Silence the Pendant from last year, but whether or not it’ll be enough to warrant that much use of the camera remains to be seen. For what we get though, it is wildly distracting and all I can do was hope the inconvenience will pay off down the road. The game’s writing is a completely different issue. I’m not sure who is to blame for this one: Sekai Project for the translation or AiD for the original writing structure. Either way, it’s a rough sit for some scenes. The dialogue manages for the most part, but scenes can get wooden fast and spins between shoveling the audience under the fantastical jargon of this world, awkward tones that don’t fit the situations being talked about and memetic humor. Now, I’m well aware that my writing style is on its way out and if I am told one more time that ‘telephone’ is bad grammar by my Spell Check, I swear I will toss my entire PC out of the HQ. But by the end, it felt like I was reading a damn Tumblr page…and considering this world has its own version of Tumblr I don’t know what that even means. The style of writing, or localization, needs to be rethought. I have written at length on my issues with Sekai Project’s localization teams on other projects and while it does seem a bit better with the handful of SP titles I’ve played so far in 2017, there needs to be visibly marked improvement moving forward. The current style doesn’t sound ‘modern’ as much as it sounds like an amateur’s first draft. There also seemed to be some issue with the UI. I like the minimalist style, but when I recently went through it to get screenshots and double-check certain critical points, it was clearly broken. Using the left mouse key still works fine, but it’ll be interesting to see how it holds up moving forward. Other than that, I didn’t notice any glitches or bugs. I have spent just north of thirty hours playing Side: Above. That, with no choices or extras, is a bit of a sit. Currently, it’s retailing for $14.99 and with my issues, I cannot recommend it: even if it were to go on sale. With so much of the game being able to be extracted, we need something to replace it with and that is Side: Below – you know, the extra game they had to make because of the filler content? Once that is released, good or bad, then there will be some value to Fault Milestone Two. Where does Alice in Dissonance go from here? The immediate project is Silence the Pendant which is still slated for sometime this Summer, then Side: Below to complete Fault Milestone Two. Both titles have yeoman’s work in front of them. StP needs to gives us a strong understanding of Ritona while adding some complexity and history to her character. Side: Below needs to give us a worthwhile antagonist in the Doctor while finally giving us a moment for the characters to grow and lay down a clear path for their continued journey. Those are micro level issues with the macro level problem is that both titles need to show, once and for all, that AiD can deliver a solid story becaues, so far, they haven’t. Side: Above isn’t terrible by any means, but the idea that Fault Milestone Two was split in half for what is essentially several hours of empty filler is why the need to higher those kendo-wielding, plot fasci I mentioned earlier. Someone, SOMEWHERE should’ve stopped them but since no one didn’t we have a lukewarm idea unable to fully execute. The tools are certainly there, but its time for AiD to step up to the plate and show they can deliver. Because ‘Meh’ simply isn’t good enough.